As a Los Angeles photographer of bar or bat mitzvah events, I know that creating a beautiful family portrait at the event is always a priority. Family members are all dressed up, often in support of a theme, and it's wonderful to be able to capture a beautiful memory of how glamorous everybody looked. 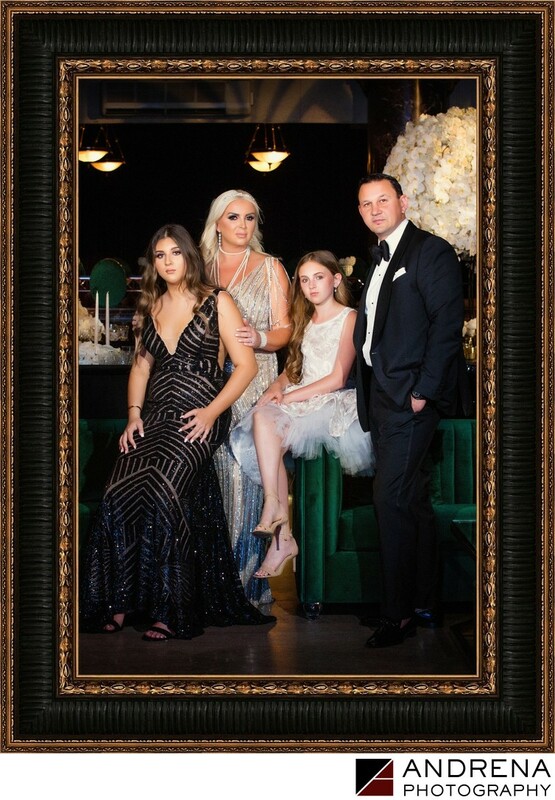 For this portrait of a family at a Great Gatsby themed bat mitzvah, I positioned the family in a unique way, using the green velvet lounge furniture to assist in posing. Since the theme of the event was Great Gatsby, I thought that hot lights would be the best lighting for this image. The end result is a family portrait that their friends have absolutely raved over, and I'm delighted that I was able to create this beautiful memory for them.